Topcast TMF-R are coreless induction melting furnaces capable of melting ferrous, non-ferrous, precious metals. The crucible can be tilted, the drive can be electrical, hydraulic or handwheel. The frequency converter design approach uses parallel resonant typology adopting the latest and most advanced IGBTs modules available worldwide. Galvanic insulation between coil and power mains gives the maximum safety for the user, while digital technology makes our furnaces soundless, versatile and reliable. Fibre optics connections give the highest immunity to electrical noise also in harsh environment. Temperature control can be chosen between IR optical pyrometer and thermocouple while the electronic board implements an advanced self-tuning thermoregulation algorithm with exact temperature control. Melting plants can be provided with one or more melting stations using a power switch to drive one station or the other. Optionally we offer a master-slave configuration featuring contemporary power-sharing between two or more power stations. Maintenance of the furnace is very easy. 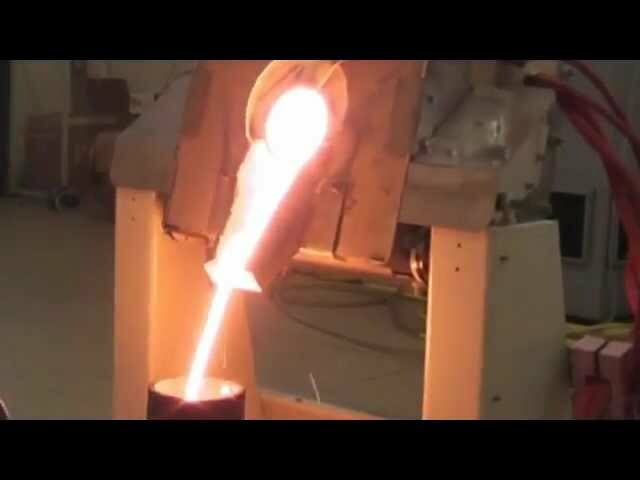 If the furnace is crucible-based it allows rapid changing of the crucible and the safety refractory shell. Bigger coreless furnaces use ramming-mass. Inert gas or gas-flame are foreseen to protect the melt from oxidation. A touch screen display is provided for a fast and user-friendly interface. A water cooling plant is needed to cool the induction heating coils and the power supply. Topcast can provide different solutions in terms of power and crucible capacity, please contact us and we will find the best solutions for your needs!